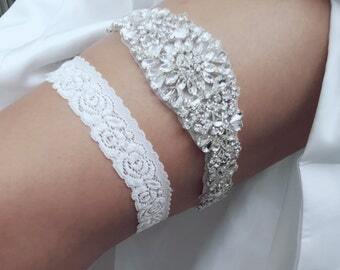 Wedding Garters made with fine stretch lace. The jewel is made with high quality, sparkly rhinestones. Measurement: Select your thigh measurement in the Size drop-box at checkout. To measure your thigh, use a soft measuring tape and place it where you would like to wear your keepsake garter. You can use a piece of string and place it against a ruler to get your measurement. Please do not take off inches as I will take in the appropriate amount to ensure a comfortable fit. I will adjust the toss garter according to the measurement of your keepsake garter. Processing: Please allow about 3 to 5 business days to complete your order. NOTE: Please leave your wedding date or date you require your order. Shipping: All orders will be shipped by USPS First Class Mail with tracking and delivery confirmation. Please convo me if you would like a custom piece made to fit your needs. Very Pretty, cannot wait to wear on wedding day! Amazing! So much more beautiful in person! Customized pouch to also hold my insulin pump, thank you so very much! I love it! Love these garters! Exactly what I wanted and it's so sparkly in person! 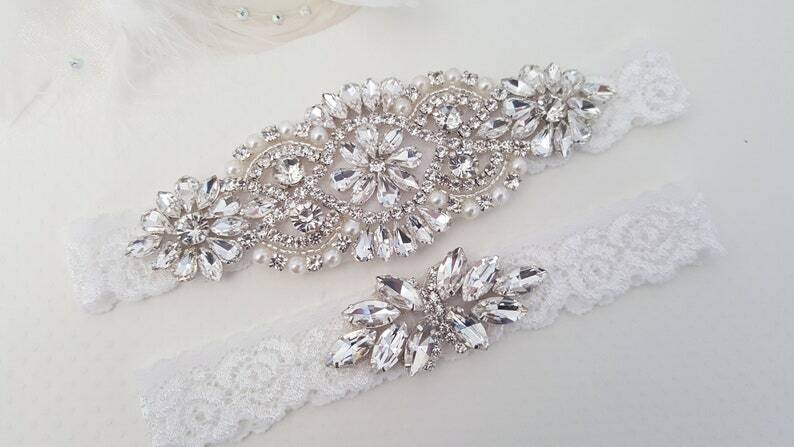 The garter set looks so pretty! Can't wait to wear it on my wedding day! We accept Paypal and credit cards as a primary methods of payment. Payments must be made within the same day of purchase. If you do not have a Paypal account, you can still pay using your debit or credit cards. ***We APPRECIATE your visit and purchase! Thank you! We only ship to the address in your Etsy profile. Please make sure that the address is current and updated. If the wrong address is provided and the package is returned to sender, the buyer must pay the shipping cost to have it sent to the correct address. Please be sure to double check your shipping address. One Fancy Day is not responsible for damaged, lost, stolen or undelivered packages. No refunds will be issued if the address is wrong or for damaged, lost, stolen or undeliverable packages. If you are concerned about items being damaged, lost, stolen or undelivered, please consider adding insurance to your order and we recommend you to contact us for pricing. For U.S. Orders: All items will be shipped via USPS First Class Mail with tracking and delivery confirmation. Insurance is available for an additional fee. Please contact us for pricing. If you need a rush shipment, please contact for pricing. For International Orders: All items will be shipped via USPS First Class Mail (6-12 business days but can take longer depending on customs in your country). No tracking is available for this shipping method. Express International shipping (3-5 business days with tracking) is available at an additional cost, please contact for pricing prior to making your order. Orders shipping outside of the U.S. may be subject to customs duty or fees which, as the buyer, you will be responsible for it. Please do not hesitate to contact us if you have any questions or need any additional information to help with your purchase. We strive to provide you with superior service and satisfaction.